Native & Search carousel ads allow you to take advantage of powerful storytelling techniques to deliver impactful messages that drive greater user engagement, interest and demand. With carousel ads, you can highlight your product features, its benefits and attributes by using a sequence of image panels that serve to tell a compelling story. Native & Search carousel ads are available on desktop, mail and mobile. Use up to 5 images (or a minimum of 3) to communicate the value of your product and drive engagement on Yahoo web properties. an impression beacon for the entire carousel ad unit. an impression beacon for individual cards. a click beacon for the card that the user clicked. Creating carousel ads is straightforward and easy to implement. Create a campaign with Visit my website as your objective. In the Ad details panel, select the Carousel ad ad option. Start by building the cards you wish for your carousel. Click the numbered card icon to add the first of up to 5 cards. Upload the cards you want in the defined formats. Enter the details for each of your cards, like Title, Description, Landing URL and so on. Carousel ads support both 1200x627 pixel and 627x627 pixel image formats. Only static images are supported, however, not videos. Each card can point to a different landing page URL. To view the complete workflow for creating Native & Search carousel ads in the Native & Search UI, see Carousel Ad Workflow, which illustrates the process. If a user swipes to the end of the card sequence, viewing all 5 cards, then 5 impressions are recorded. If the same user swipes back to start of the deck, the impressions are not double-counted. All clicks are counted individually. Reporting on how often each card was viewed, or engaged with is based on ad unit totals, not individual cards. Third-party tracking is allowed for each card. 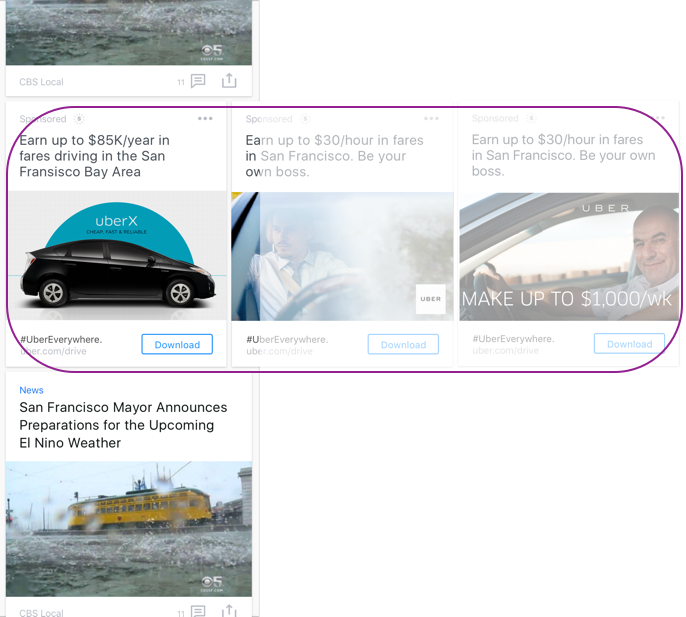 Carousel ads will run on Tumblr and syndication inventory. Support for bulk objects & types is provided with the addition of a new bulk object: Ad Assets. 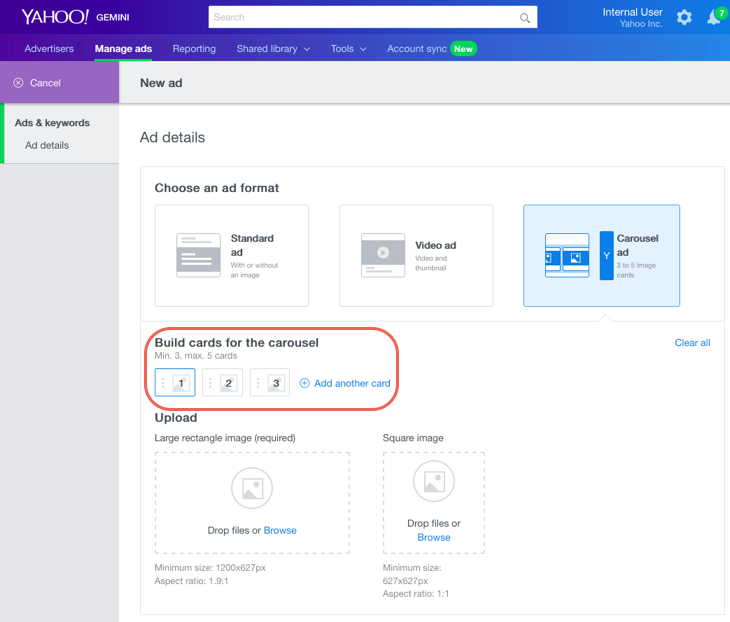 For more information, refer to Bulk Ad Assets, which describes how you can create and manage ad assets, like carousel image cards, using the fields that are available for this ad object. If you are working with the Programmatic Native & Search API, you can find ad assets and JSON representations described in the section Ad Object. Do carousel ads support video? What pricing options are supported? Will I be able to measure viewability through a partner, like IAS or Moat? What video sizes are recommended? Will videos in carousel autoplay? If I use videos on multiple cards, will they all autoplay? The following FAQs are in reference to support for Video for Carousel ads. Yes, video is now supported in carousel for all users. However, video in carousel will only be available on mobile. Desktop support is expected at a later date. CPC and CPM. There is no change from current (static) carousel pricing models because video in carousel is a slot asset, not an ad type. Because video in carousel is considered a slot asset and not ad type, existing carousel (static) reporting is used, so no video metrics are reported. For now, since we are using existing carousel (static) reporting, 3P viewability for videos in carousel is not available. Videos can serve on any card, including multiple cards. Videos in carousel will autoplay (while muted) when users are on Wi-Fi. Only one card plays at any given time. Videos in carousel will auto-loop at the end of the video.